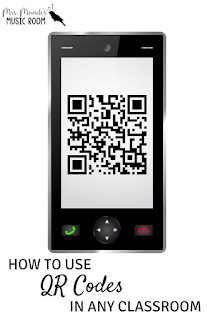 A while ago, I heard about teachers using QR codes. I had just received 8 iPad minis for my music classroom as part of a district grant, and while I was intrigued, I had a hard time wrapping my mind around how to use them in my classroom. Since then, I've experimented a bit on my own, have purchased QR products from other teachers, and have had lots of fun thinking of different ways to use them! In this blog post, I'm detailing a list of ways to use them. Keep in mind that even if you don't have iPads in your classroom, you could bring in your own iPad, iPhone, or Android, and have students use just one device during centers (working in small groups.) Here are my favorite ways to use QR codes; I'm including ways to use them both in music and grade-level classrooms. 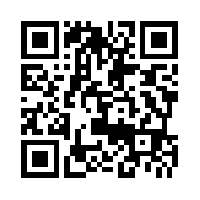 Keep reading to find out how to download my ti-tika rhythm QR code sheets for free! The great thing about using it in this way is they can independently read, then listen to how it should sound. I can see this working very well in a grade-level classroom, or as students learn a new language, as you could record audio pronouncing the word correctly, or reading a sentence correctly, and students could read, and then listen. I recorded as a mp3 on my iPad in GarageBand, then saved it into Dropbox, and then linked to that file with www.qrstuff.com. The tricky part about using Dropbox is that your students will have to know to hit the blue "download" button to listen, and then they hit the "X" button or the back arrow button to get back to the app, depending on which QR app they are using. So as I was trying to figure out how to have students cover in small groups, I realized that I could use QR codes for students to scan so they could directly go to the YouTube video for the song of their choice, listen and watch, and work in GarageBand to cover the song. This would be much quicker than trying to have students search on YouTube, because let's face it...there are MANY things on YouTube you do not want them to watch! I plan on creating a sheet with several different school-appropriate song titles, then they scan the one of their choice and listen. This could work with any YouTube video. You'd just have to make sure to sign each iPad into your filter, if you have one blocking YouTube. 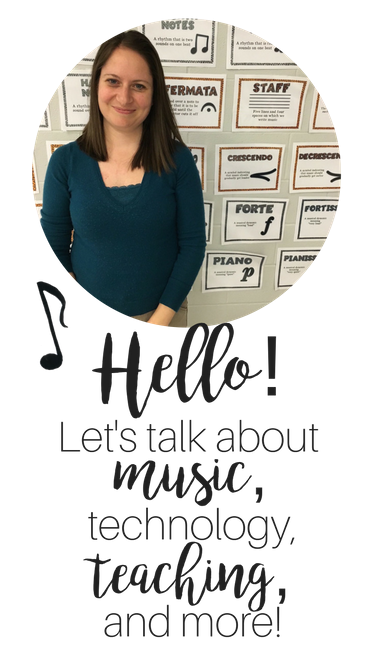 I recently bought this Instruments of the Orchestra set by Noteworthy by Jen, and love this idea...you can have students try to name the instrument and the family, and then they scan to check their answers. 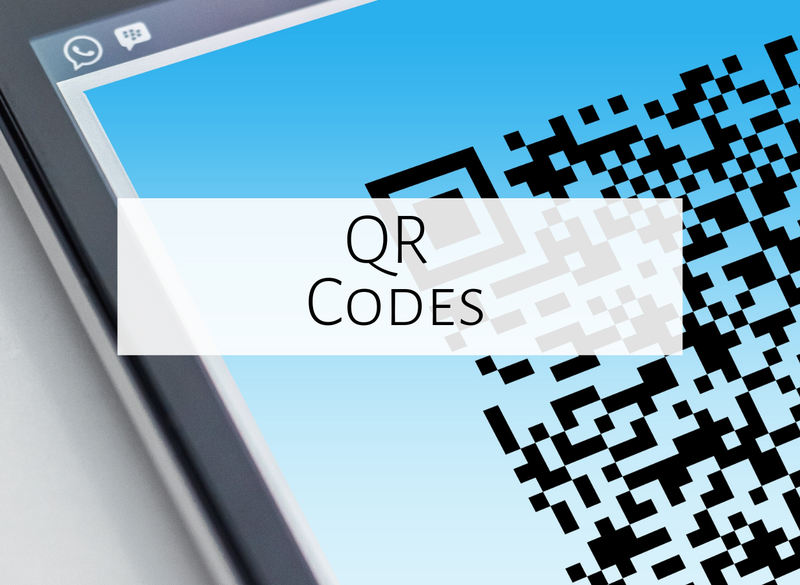 Of course, this way of using QR codes can be extended to so many different activities and subjects, from checking math answers to having students identify the title of a piece during listening centers to having students name US states! 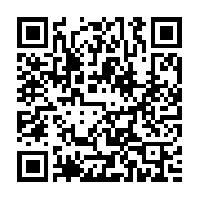 If you want students to visit a website, such as the Young Person's Guide to the Orchestra, you could have them scan a QR code instead of trying to write out an entire web page address. This would work even better if you had a few different websites to choose from. Last week, at my oldest daughter's daycare, I saw an awesome bulletin board--students had created their own silhouettes but didn't label the child's name--and then parents could scan the QR code to figure out whose silhouette it was! How fun! I could see using QR codes as a way of parent communication--to have parents guess whose composition or work they are looking at, to link to a video of students singing, dancing, or performing, to have parents and students listen to a piece of music by a famous composer, etc. The possibilities are endless! And now for some practice! How do you like to use QR codes? Feel free to comment below, and happy scanning! I (and the students!) 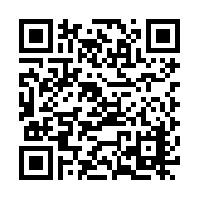 LOVE using QR codes! I've used them for a variety of things, composer bios/music, instruments of the orchestra, listening selections, note naming practice. The possibilities are endless! Thanks for mentioning my QR Instrument Activity--I'm so excited I made your list :) I hope your students love it!